Patricia Gattepaille is a visual artist, puppeteer and mask sculptor. For the last 15 years, Patricia Gattepaille is working for different theatre companies, puppet theatre and street theatre. By founding ‘Azur et les Aéroplanes’ company, she stresses on mask theatre sculptures. - “Shabano Theatre” company: Scenographer for the show “Wayra et le sorcier” (Wayra and the witch) and “Contes à penser” (Tales to think) in 2007 and 2010. - “Alchemik theatre” company : Masks, puppets and accessories for “L’histoire du soldat” (The soldiers tales) by Stravinsky, directed by Pierre Alexandre Jauffret from Geneva in 2006. - “Défriche Compagnie” (Clearance company) : Mask for “Le bout du monde” (The ends of the earth), in 2004. - Opera of Lyon : Masks and accessories for ‘Lulu’, ‘Pollicino’, ‘Orféo’, Cendrillon’ (Cinderella) and ‘L’ivrogne corrigé’ (The drunkard corrected), from 2000 to 2009. - “Cie Voix Off” (Off screen voice company), Damien Bouvet, : Accessories for ‘Chair de Papillon’ (Butterfly Flrsh) in 2001. - “Cie des Saltimbanques” (The travelling performers) – Benoît Lavigne: Masks for ‘Romeo et Juliette’, ‘Beaucoup de bruit pour rien’ (Much ado about nothing) by Shakespear; ‘Le concile d’amour’ (The love council) and ‘La foire de Saint Barthelemy’ (The fair of the massacre of Saint Barthelemy), form 1993 to 2005.
masks for ‘Caligula’ in 2000. - Le jardin planétaire (Planetary garden) , Parc de la Villette, Paris. Sculptures. - “Sanvic – Abricadabra theatre” company: Scenography, sceneries, puppets, props and acting for: ‘Un jour, les mains’ (One day, the hands); ‘Des mains et merveilles’ (Hands and marvels); ‘A la recherche du doudou perdu’ (Looking for the lost soft toy) and ‘Non d’un petit bonhomme’ (The name of the young boy); from 1991 to 2001. - “Bululù theatre” company: scenography, puppets and acting for ‘Face à face’ (Face to face); ‘Boris le magicien’ (Boris the wizard) and ‘Jean Brique’ form 1989 to 1991. - Creation of the show ‘Pas de pieds’ (Out of depth) in 1997 and ‘Un jour, la nuit’ (One day, a night) in 2009. 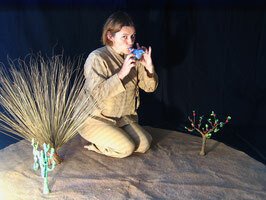 - Exhibition of theatre masks ‘Masques continents’ in 2007. - Exhibition of theatre masks ‘Le gardeur de troupeau’ (The flock keeper) in 2005. 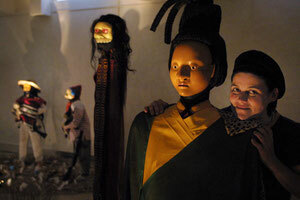 - Exhibition of theatre masks ‘Sombres Soleils’ (Dark Suns), at the museum Arthur Rimbaud of Charleville-Mézières during the puppets World Festival in 2000. - State design and technical management of the Latin America pavilion for Charleville-Mézières festival in 2000. - Installation and mask performance: ‘Lysistrata’ with ‘teatret company’ in Denmark and Germany in 2000, 2001 and 2002. - Exhibition of theatre masks ‘Soleil Jaguar’ (Jaguar Sun) at the Gallery of ‘Cercle optique’ in Lyon in 2002. - Exhibition of draws and theatre masks at MAPRA in Lyon in 2004. Having trained as a visual artist and passionate about the issue of sculpture in theatre, my attention was first caught by puppetry and the theatre of performing objects. In my many years of theatrical adventures with different theatre companies, I have had the opportunity, or rather the good luck, of dealing with every aspect of theatre (scenery and prop design, costumes, light and sound management, stage direction, manipulation of puppets and acting, creation and distribution of shows). The vivid emotions aroused by the presence of masks, brought back from my early childhood spent in Central Africa, combined with my experience as a theatre-oriented sculptor have confirmed my desire to focus my research on the fascinating « object » which is the Mask. This connection with African masks has helped me understand and respect the expressive and poetic power of this art, its embeddedness in culture and the impossibility of making any copy which makes sense. Therefore, it’s by drawing from my own cultural heritage and looking at my own time that I seek to create new Masks, as an instrument maker would search for new instruments to put in the hands (and under the sensitive breath) of today’s musicians. Is it because it forms one body with the actor that the mask is so fascinating ? Is it because it compels one to search the depths of human soul and to exhibit it under the great sun of the spotlights, revealing itself as an art of precision, rigour and commitment ? The Mask transcends the limits of theatre. The great variety of its forms, taking root in diverse cultures and life, leads me to further my research and to share my discoveries with professionals as well as with all kinds of public.